Dirk Gently’s Holistic Detective Agency is shutting down. Deadline reports BBC America has cancelled the TV show after two seasons. 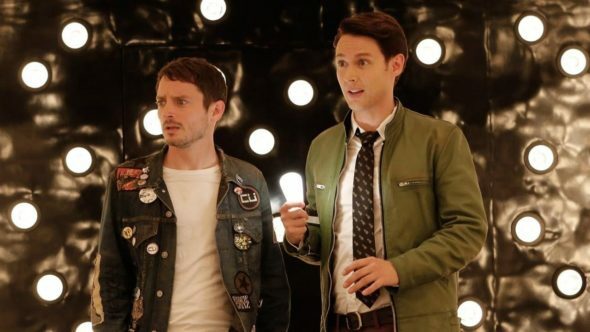 Loosely based on the Douglas Adams novels, the sci-fi comedy centers on Dirk Gently (Samuel Barnett), an eccentric time-traveling “holistic detective” and his reluctant sidekick, washed up rocker Todd Brotzman (Elijah Wood). The cast also includes Jade Eshete, Hannah Marks, Mpho Koaho, Fiona Dourif, Dustin Milligan, and John Hannah. The cancellation of Dirk Gently’s Holistic Detective Agency is not that surprising given the show’s low ratings. Season two, which just wrapped, averaged a .07 rating in the 18-49 demo and only 248,000 viewers. What do you think? Are you a fan of Dirk Gently’s Holistic Detective Agency? Are you disappointed it’s been cancelled? More about: BBC America TV shows: canceled or renewed?, Dirk Gently's Holistic Detective Agency, Dirk Gently's Holistic Detective Agency: canceled or renewed? Too bad. A truly unique and quirky show — always entertaining. Fiona Dorif (daughter of Brad) was hilarious. I hope her character is given her own series. Bummer! A welcome diversion from reality while holding true to the weirdness and humor of Douglas Adams. The audience was always going to be small, but they’re loyal. crap, it was on of the most refreshing show i saw recently. it was silly and clever at the same time, i would have hoped for more crazyness to come. So dissapinting that series has cancelled. I wish they will understand that’s total underestimating of great idea. I’m sorry to see it go. I liked the ensemble very much and looked forward to watching the quirky show every week. I’m a bit disappointed in public imagination. Overwhelmingly sad to hear this news. When I read the show premise I wasn’t at all interested. Then one day with nothing else to watch, I watched a random episode. I ended up watching all of the other episodes over the next week and eagerly awaited the new airings. I suspect the show may just have a slow burn. I hope it will be picked up by another network/provider. We LOVE DGHDA! I hope that it gets saved. We only stumbled across it. I believe that most of the issue is that it was not well advertised. Hey guys. Dirk Gently won’t play on BBC America anymore, but AMC is still on board and Netflix is waiting to have season 2 to give an answer. Dirk Gently can be saved. My husband and I both watch this show. It is our favorite and we think it is the best show of this season. I can’t express how sad and disappointed we are to hear this news. I hope they change their minds.